It’s rough, it’s rainy, your clothes are soggy and the wind blows off your headphones ( I swear). It’s time for spring! Let me assure you that you will witness emotional bloom on your next visit to London. Between March and May the weather will settle into what we’ d expect : spells of sunshine, longer days… we’re practically (and happily) on our way to summer! Here a few recommendations to visit around town, regardless what the definition of spring really looks like this year 2019… may flowers bloom, rowers row and coffee be discussed by hipsters ! London Coffee Festival 2019 at the Old Truman Brewery marks the transition from wintry hot chocolate to changing over to your favourite go-get-it brew in spring. Whether with or without a sugar high the new season is headed by the rise in energy offered by a cup of coffee. Analyse new beans and new methodologies between the 28th and 31st of March on Bricklane, East London. The Truman Brewery boosts various spots to hide from the rain. Spectatorship shouldn’t be underestimated and the occasions to witness sporty men and women rowing passionately will lead you to beautiful spots around west London. 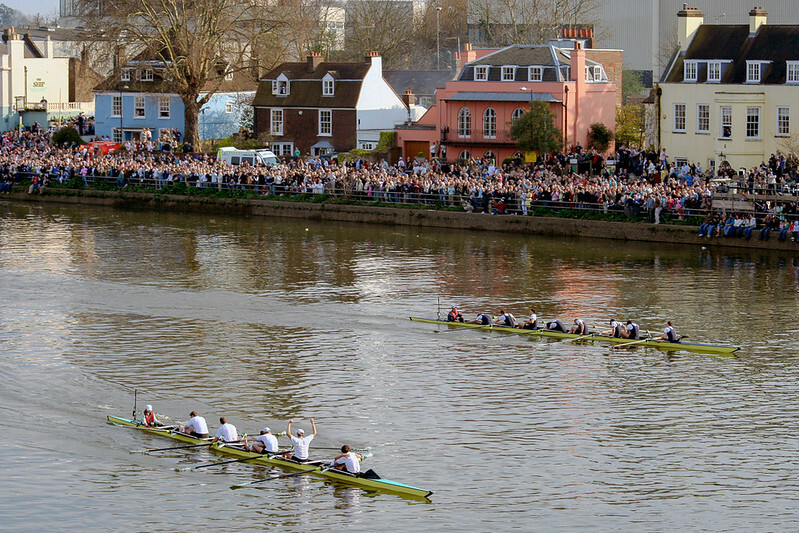 The annual Boat Race starts at Putney Bridge and runs along the tidal bit of the River Thames till Chiswick Bridge. Cambridge and Oxford University compete this way since 1829, offering an occasion to stroll the banks or sit in a pub overlooking the spectacle. Show your support on the 7th of April this year ! If you were to visit the Boat Race you’d be pretty close to one of the largest public parks of London after Lea Valley called Richmond Park. I’d like to point your attention to a former woodland that grew to become a 40 hectare plantation of oaks, beeches and sweet chestnuts. This part of the Royal Gardens is called Isabella Plantation and offers a sensory boost to arouse your spring feelings : camellias, magnolias, daffodils and rhododendrons in full bloom ! It’s a celebration really, unless you participate of course. There’s been controversies last year regarding a drunk man who joined the race equipped with a starting number he’s found unused crossing the final line heroically… I am saying that to indicate that watching the marathon is a boozy business.. Regardless your intake preferences though this race offers yet another opportunity to walk along the barriers stretching across town – cheering wholeheartedly, with a beer in your hand, or with a cup of coffee ! It takes place on April 28th and runs from Blackheath via Greenwhich in South London over Tower Bridge to reach Buckingham Palace. A stroll ideal for spring and in a truly festive spirit. It’s people watching of a special kind : not just the sporty, it’s also the fun loving that you’ll encounter. Panda bears, Zebras.. costumes en masse. it’s a celebration!